Summary: In this post I show how to modify the style of the QS Script Editor window. 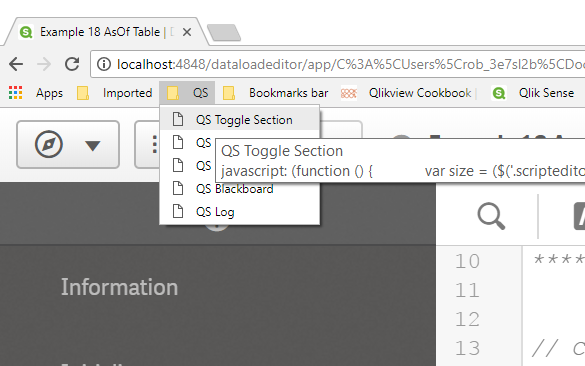 An astute reader — Johan Roelofsen — of my blog on bookmarklets noticed I had a bookmarklet named “QS Blackboard” and asked if this was used to change the window background color. Excellent guess, spot on, but there’s more to it. Fortunately QS uses the CodeMirror (CM) editor which provides a theming capability. Theming the CodeMirror window is done by loading a style sheet and then making an API call to use that style. The instructions that follow will show how to implement your own custom theme in QS Desktop (I assume it will work in Enterprise as well, just haven’t tried it). Note that we will not be modifying any of the installed Qlik software files! Create a new subfolder (below Client) named “cmtheme”. This is the folder that will contain your CM style sheets. Download or build a theme-name.css file in the cmtheme directory. You can try out various existing themes on this demo page here and download the corresponding css file from the CM repo here. “Projector1” available here is a theme I’ve built for projecting. If you read the doc or look at the examples, you’ll see the pattern whereby you must define .cm-s-themename selectors in your CSS. If you start with one of the CM themes, you’ll want to add selectors for QS script specific elements like function, table and field. It’s the same bookmarklet code for any theme, I just change the hard-coded theme variable. To “unapply” your theme and return to QS native, just press F5 to refresh the browser. Have fun. And remember when you tinker with something like this the best approach is to not update the vendor (Qlik) software files and instead seek a non-intrusive approach. Easy answer. Take the “Web Dev for Qlik Devs” course from Websy. You can self-study online through the Websy Academy, take an on-line instructor led course or have one of the Websy team — including Rob — deliver a course at your site to your entire team. If you’ve ever seen my presentations on automated testing of Qlik apps, you know I’m a big fan of the free Qlik Scalability Tools — both QV and QS. I use the Regression Test feature to automatically validate Qlik app changes before promoting to production. Regression testing allows us to validate that charts continue to produce correct results after updates are made to the application or platform software. This graphic provides a brief overview of the regression testing concept. The Qlik Sense Scalability Tool (QSST) provides a GUI workbench to run and analyze regression tests. 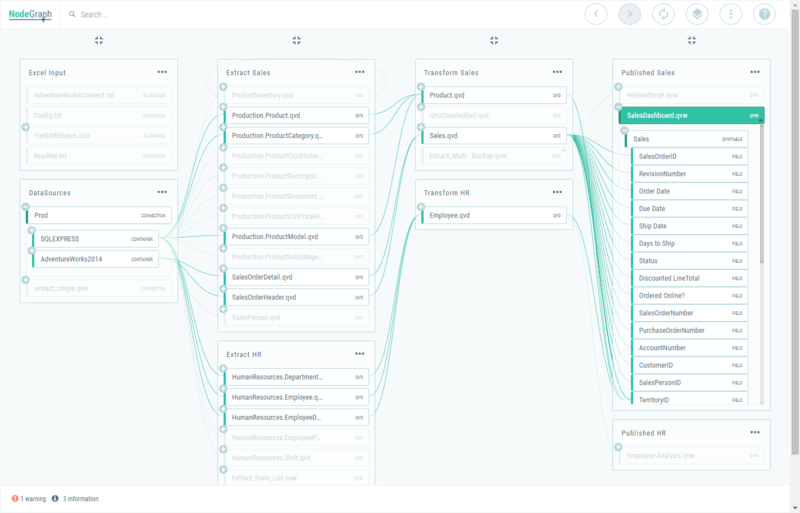 The workbench is a great tool for a developer or QA Analyst to validate an app on an adhoc basis. What if I want to run the analysis unattended on a schedule? For example, after every reload to validate that my app is still working correctly and my expected data was loaded. 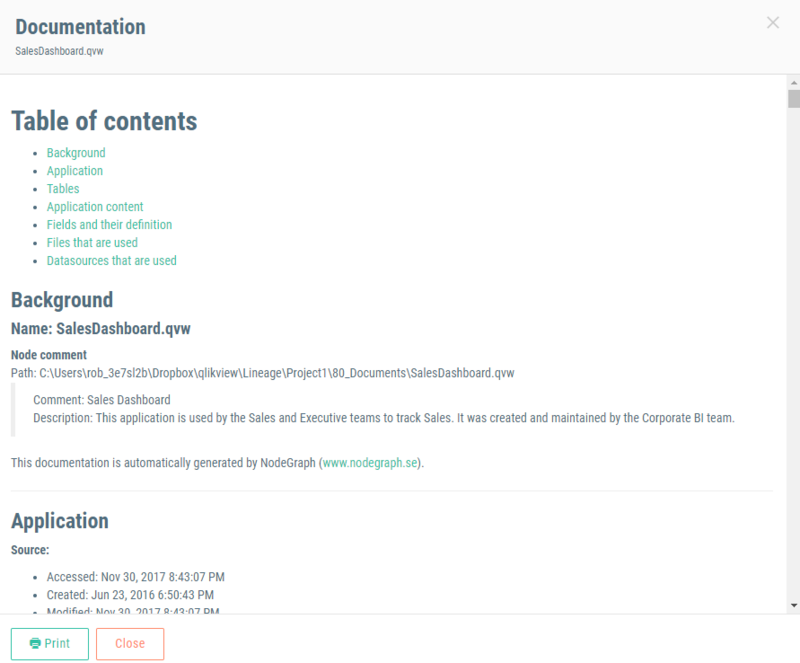 In this post I’ll demonstrate using a system monitor to run the regression test as an ongoing validation and send an alert if the validation fails. I won’t go into the details of setting up the Scalability Tool. You can get that from the product documentation. If you would like me to do a presentation on automated testing for your team contact me here. We will need a system monitor that is capable of running commands on a schedule, monitoring the command output and sending alerts or status via something like email or Slack. You may already have a capable system monitor installed at your site. NodeGraph is my current favorite Qlik-centric testing tool for ongoing quality monitoring (I’m a partner). NodeGraph’s Test module allows for testing expression values, presence of fields and update times. At the moment NodeGraph does not support running QSST Regression tests, but I expect it will be part of the product by 2018Q4. For the time being, I’ll demonstrate batch regression testing using Woodstone’s Servers Alive, a low cost but powerful system monitor I’ve used in the past. You can try Servers Alive for free. Let’s assume we have used the QSST workbench to author the regression test scenario and have executed the scenario to create a baseline log. 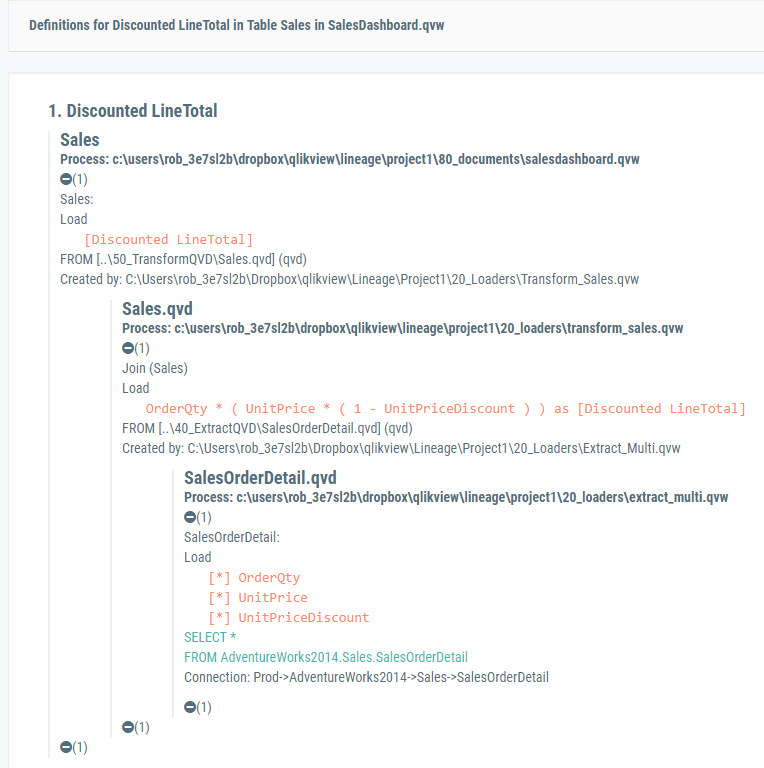 When using the workbench, we would re-execute the scenario at a later time to create a compare log and then analyze the differences between the logs using the workbench Analysis tool. QSST provides command line versions of both the scenario executor (“SDKExerciserConsole.exe”) and the regression log analysis (“RegressionAnalyzerConsole.exe”) . We will need to bit of script to stitch these two operations together and process the output. I’ve posted a powershell script here that wraps all the necessary operations and exits with an ERRORLEVEL of “1” if validation fails (differences found between compare and baseline logs), or “0” if no differences are found. Download the RunRegressionTest.ps1 script and place it in a directory named “Regression”. Create a subdirectory under Regression named “baseline”. Copy your baseline log file for each app of interest to the baseline directory. Do not rename the file. Following the comments in the file, update the first three variables in RunRegressionTest.ps1 to identify the location of your QSST install and your scenario json file(s). We can check that the script runs correctly from a powershell command prompt in the “Regression” directory. PS C:\QlikSense-Projects\Regression> .\RunRegressionTest.ps1 "ABC Sales Demo"
Now to implement this in Servers Alive. In Servers Alive we define things to test as “checks”. 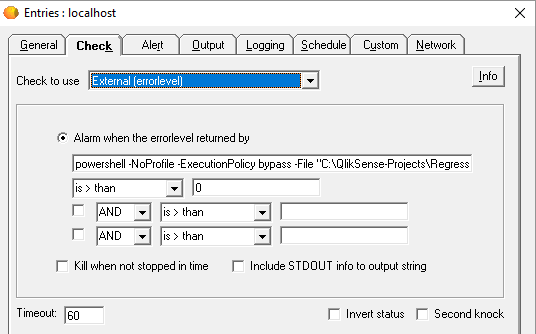 In this case I’ll use the External(errorlevel) check type and provide the command string to run my powershell script. powershell -NoProfile -ExecutionPolicy bypass -File "C:\QlikSense-Projects\Regression\RunRegressionTest.ps1"  "ABC Sales Demo"  "p2"
where “ABC Sales Demo” is the name of my scenario json file. “p2” is a dummy parameter that works around a windows bug. Without that extra parm, a blank space is added to the previous parm causing a failure. On the Alert tab I’ll specify to send a message to Slack on failure. On the schedule tab I’ll specify when to run this check. All set up! When run either manually or on schedule, a failed check — that is, the regression test found unexpected differences — the check will display red on the SA console and I’ll also receive a Slack message. I’ve just introduced a number of moving parts. If this is all new to you what I hope you’ll take away is that formal, structured and automated monitoring of your Qlik Applications is possible with relatively low cost and effort. Want some assistance with planning your testing strategy and implementation? I offer consulting in planning and implementation of automated testing and monitoring for your Qlik environment. Contact me if you want to chat about your needs and how I can help. I also typically do an optional lunchtime session on testing at the Masters Summit for Qlik. 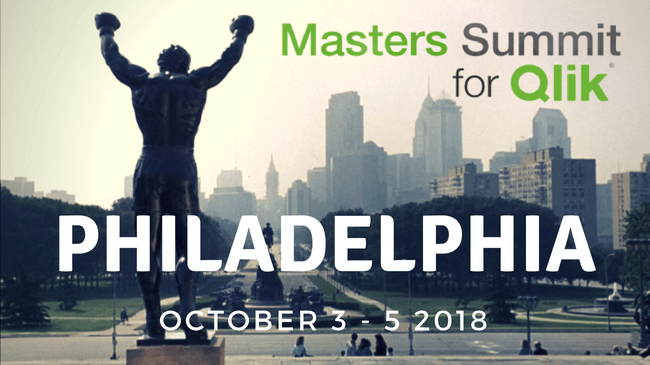 Come along to Philadelphia or Johannesburg to talk testing and many many more Qlik topics. The ability to analyze applications on the Enterprise Server. You still install and execute QS Document analyzer on the Desktop, but you don’t need to move the application to the Desktop. The option to specify a Bookmark that should be applied before calculating objects. This is particularly useful when an object has a calculation condition. Another interesting update is that we are now validating all expressions and will flag any expression that has a syntax error. You can download the latest version from the tools section of this site. Thanks to Axis Group for their input on this release. I’m looking forward to an ongoing collaboration. You can report any issues with QS Document Analyzer in the issue tracker here. I just read a good post by Kamal Kumar Sanguri on QlikCommunity. 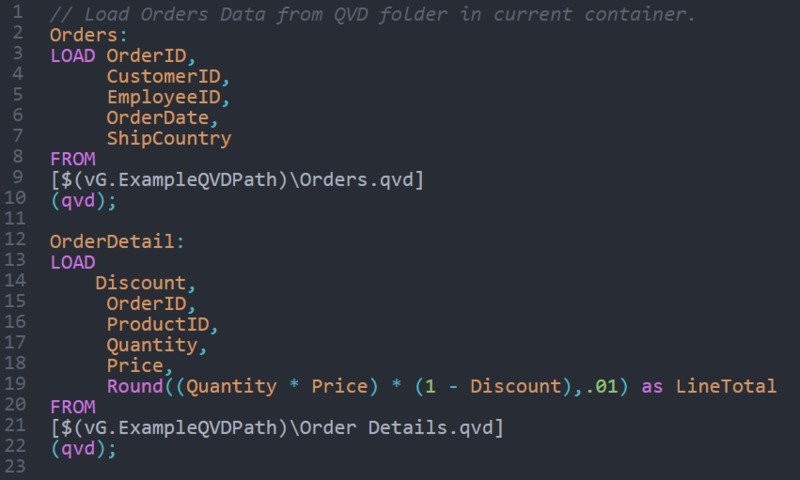 Kamal’s post reminded me that managing variables in QlikView has always presented some challenges and over the years various techniques and code snippets have been shared to address those challenges. Most folks quickly find that maintaining variables in external files loaded with a script loop is a good approach and resolves common concerns regarding shareability, dollar sign escaping and so on. Sometimes you encounter a need for an adhoc import or export of variables. Kamal’s post offers some useful code snippets for that. Several years ago my colleague Barry Harmsen wrote a post on QlikFix.com that shows some useful macros to manipulate Variables. Barry and I subsequently collaborated on a desktop utility that handles both import and export from a menu. 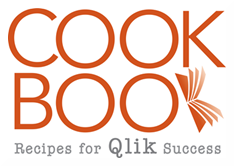 While the download link on the blog is dead, I’ve reposted the utility on the QlikViewCookbook Tools section for download. Kamal said that there is no way to directly load variables from one QlikView document to another. That got me to thinking. It is possible, but gee, no one has ever asked for it. What’s the use case? When I want to do an adhoc copy, I use the desktop utility referenced above. I have seen a number of customers who generate complex calendars into QVDs followed by generation of variable for use with the calendar. Calendar QVD consumers incorporate the variable generation logic with an include file. It works. Would it be any better if calendar consumers loaded the variables directly from the calendar generating QVW? I think not because there is possibility of a mismatch between the QVW source and the Calendar QVD. All that said, maybe you have a use case for loading variables from a QVW? No one asked, but for the record here is the script to load variables directly from another QVW. I just wrapped up the week at Qonnections 2018. I found it to be an inspiring conference and the most positive I’ve attended in years. What was inspiring? The cognitive insights demo was fantastic. This is the future of BI. We have well understood principles and algorithms recently formalized in the discipline of machine learning. Let’s incorporate them in the tool. If the goal of data visualization is to amplify cognition of data, then I would say cognitive insights is to visualization as visualization is to data. On the technical front, the previews and demos of elastic cloud and Qlik Core provided me the “aha” moment to understand how the Qlik Big Data Index will be possible. I can see how many distributed indexing and aggregation engines can provide massively scalable access to a data lake. The most exciting announcement to me wasn’t technical, but on the commercial side. For a “small uptick in maintenance”, QlikView users will be entitled to use the same license for Qlik Sense. To me this signals a new strategy for dealing with the two products going forward. There was also a roundtable discussion on feature gap between the two products and the announcement that some level of pixel-perfect control will be available in Qlik Sense. Taken together with main stage comments from CEO Mike Capone and CTO Mike Potter, I’m seeing a needed correction to the “two product strategy” which so heavily favored Qlik Sense. No one expects QlikView to live forever, but loyal QlikView customers want to adopt a new product only when they see that it clearly benefits them. Ideally we will see a converging product that blends the best features and lessons learned from both products. I’ll be presenting three technical breakout sessions. 148255 – Options and Levels for Qlik Sense Mashup Integration: Tuesday 10:30am – This session aims to introduce you to the possibilities for re-using Qlik Sense content and data in other applications such as web pages. 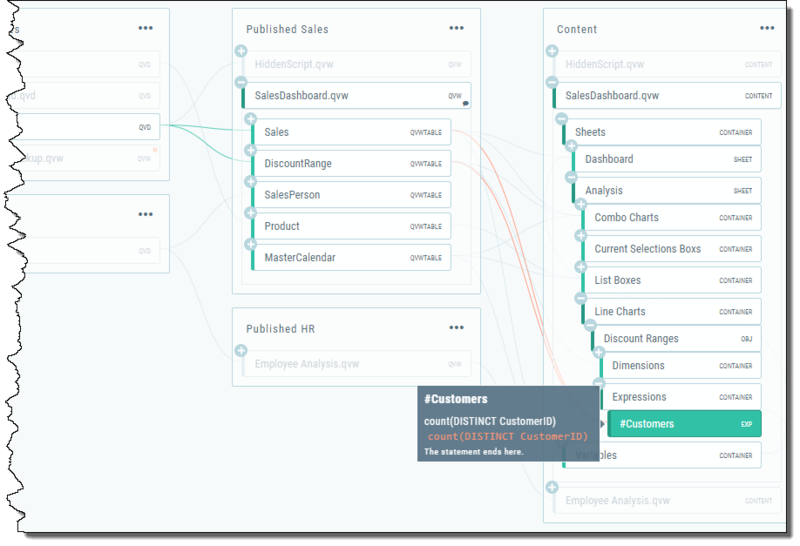 We’ll cover the very simple “codeless” embedding using URLs all the way through data fetching and custom visualization using enigma.js. This session is suitable for technical and management staff who want to understand the potential in mashups and get a measure of the effort involved. My colleague Nick Webster will be joining me in this presentation. 148870 – Automated Testing of Qlik Applications: Tuesday 3:00pm – A favorite of mine, I’ll be discussing and demonstrating the free regression testing tools from Qlik that allow you to completely automate the QA testing of your Qlik — both Qlik Sense and QlikView — applications. I’ll also touch on some current trends in unit testing and operational monitoring. 148256 – QlikView Document Performance Tuning Using Document Analyzer: Thursday 9:30am – Document Analyzer (DA) is a popular free tool that can be used to examine and improve the performance of a QlikView document. In this session I’ll be showing the tool and my typical approach to improving the response time of a specific document. Admittedly, Document Analyzer has little documentation so consider this your DA training session. If you’ve never seen DA, Dalton Ruer, aka @QlikDork recently produced a DA intro video. 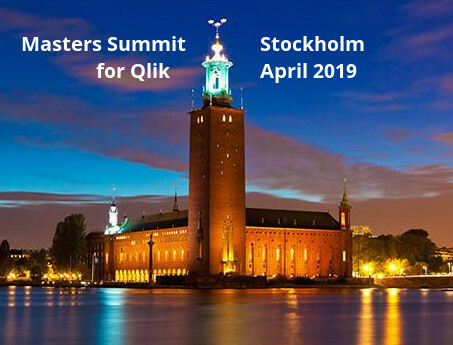 Other sessions I hope I can make it to: Nick Webster’s “Putting Qlik in a Mirror” – just for the wow factor; Göran Sander’s sessions on Butler SOS and SenseOps; Sessions on Qlik Core and View/Sense coexistence. Sadly I’m going to miss Speros Kokenes’ sessions because he’s scheduled at the same time as me. I’ll also be hanging around in the Discovery Expo — look for the hat at the Masters Summit booth or elsewhere.